In the winter of 1948, a C-47 airplane crashed in foul weather near the top of the now named Airplane Gully, killing all three people on board. The wreckage was not found until four months later during the spring of 1948. 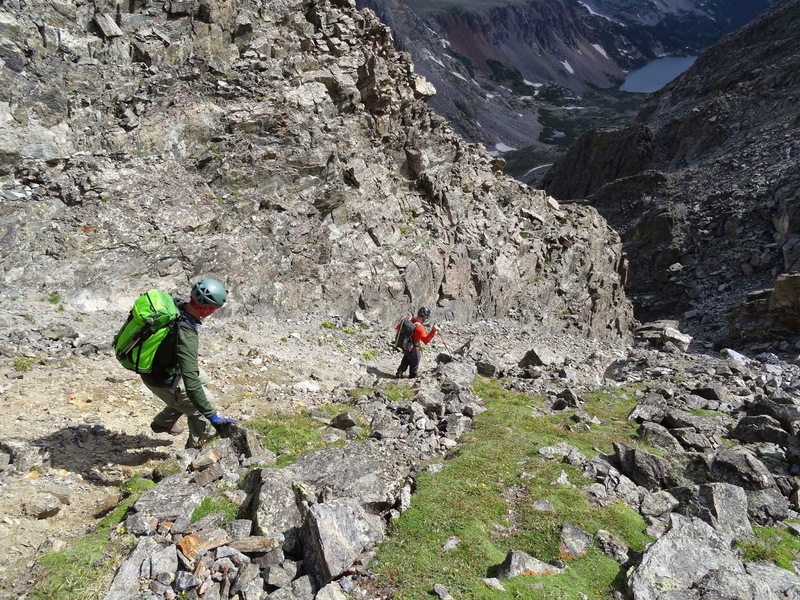 The gully is now not only a common route to reach the ridge just below the summit of Navajo Peak, but it's also a historical aviation archeology site. Greg, who was in town from New Hampshire for a week, pinged me a few weeks prior to his arrival in Colorado. 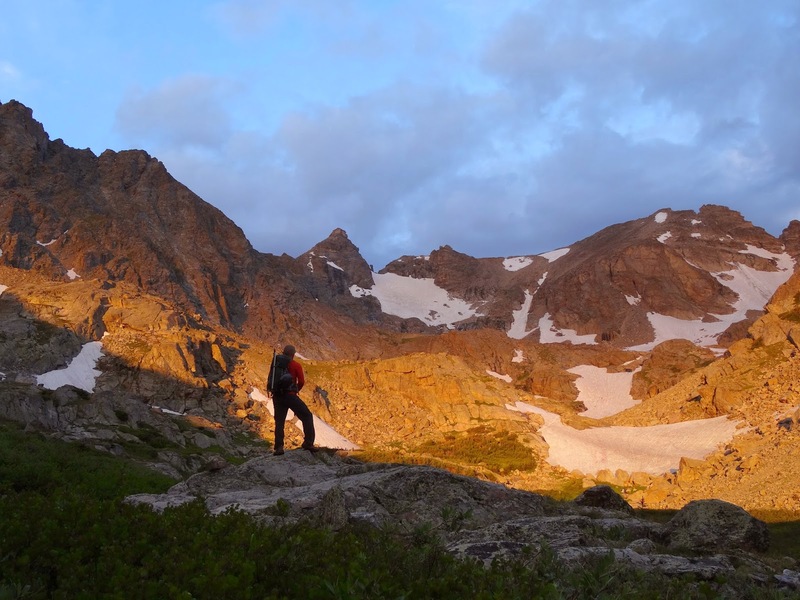 We discussed a few options including Pyramid Peak in the Elk range. However, often weather forecasts usually win, as it did this day, and we settled on Navajo Peak (with an option for Apache Peak). The forecast for the Front range was much more favorable than that of the Elk range. 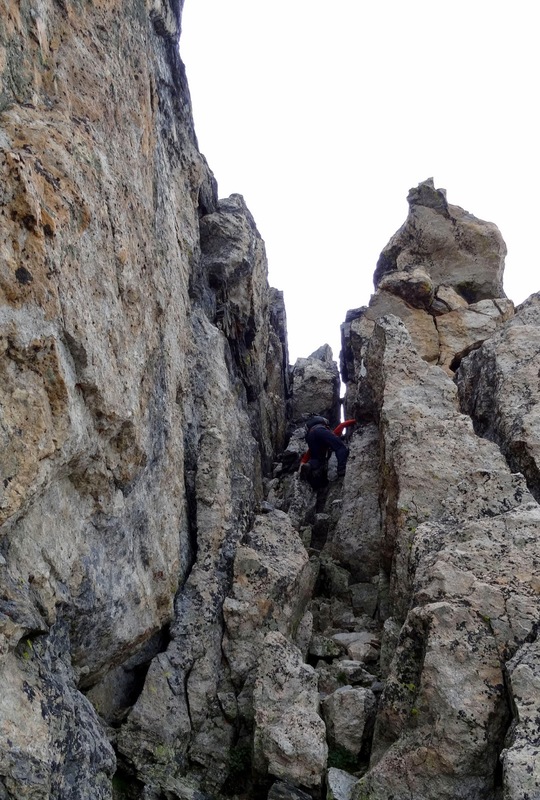 I had previously climbed Longs Peak with Greg last year during my ankle injury recovery. I was honestly a bit surprised that Greg wanted to hike with me again considering how slow and gimpy I was on the Longs Peak descent. Either way, I was happy to have some good company in the mountains and the day was made better when Mark said he would join us. We all agreed to meet at the Long Lake trailhead at 4am. We moved quickly up the trail in the dark, that is until the sun starting coming up. This is when Mark and I kept stopping in attempt to capture the sunrise and get some good pictures. Lighting is nearly everything as many photographers know. The sunrise as we were just above Lake Isabelle now, was extraordinary and rewarded us for our zero-dark-thirty start time. 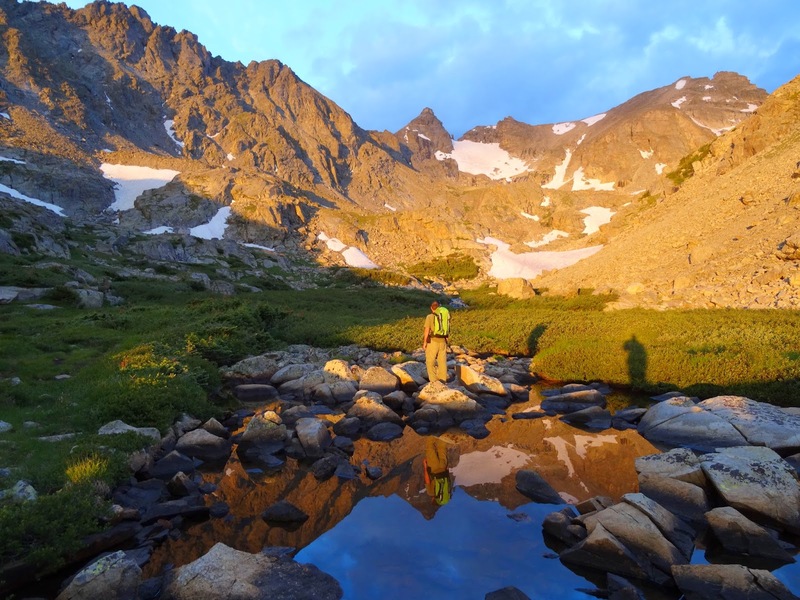 Just prior to sunrise near Lake Isabelle. Sunrise above the tree line! Possibly my favorite moment of any day in the mountains. This sunrise was worth the lack of sleep. After the amazing sunrise, we got on the move once again. A healthy dose of joking and friendly needling was going around. First it was Greg and Mark joking with me about how I might fall into the creek when crossing it because I was too short to jump it like they did. Well, this midget showed them. I ended up staying dry by using my trekking poles to vault the creek. Then Greg was needling Mark and I for taking so long snapping sunrise pictures and was joking about how we weren't going to ever make it to the summit because we'd be stopping for pictures of flowers and butterflies the whole way. We crossed a couple small snow fields and some talus and eventually were at the bottom of Airplane Gully. Here, I felt a sudden wave of dizziness and fatigue for some unknown reason. Greg was leading the way up the gully and Mark was close behind. I dragged behind and was actually considering turning around. I wondered if this was a side effect of a new medication my doctor has me taking. I committed myself to reaching at least one summit and just trudged along. We all reconvened at the airplane wreckage near the top of the gully. It was a rare sight, and sort of interesting to see a pile of aircraft engine pieces and aluminum just shredded on the mountain side. Greg and Mark approaching the airplane wreckage at the top of the gully. Mark behind the airplane wreckage. Pic taken on descent. Greg looking like he's playing a "where's Waldo" game among the airplane wreckage. Pic taken on descent. After reaching the ridge, I was feeling much better and we were only a few hundred feet from the summit. On the route to the summit, there's a class 3 route around to the west, or a class 4 chimney just east of the summit. We chose the chimney mostly just because it looked fun. I went up the chimney first being the adrenaline junkie that I am. The climb was fun, but too short. I wish it had been longer. Me nearing the top of the chimney. Greg making his way up the chimney. From the top of the chimney, it's a 10 second walk to the summit. I was happy to be sharing another summit with my friends although I was not going to stop dishing out the fun-filled joking comments. Mark was checking for a signal on his flip phone and Greg and I sarcastically wondered how a mountaineer with just a flip phone could even summit mountains. We humorously teased Mark about this while he tried, unsuccessfully I might add, to call me from the summit to leave me an equally humorous voice mail. There was also some joking that I think Mark started about how Greg in his green shirt and grey vest looked like a tall teenage mutant ninja turtle. The midget jokes kept coming too, and I think they were secretly taking bets on whether I'd fall in the creek on the way back. Greg with the lake we'd been at during sunrise behind him. I think Greg had the energy to go over to Apache, but I wasn't really feeling it, and I suspect that Mark was on the fence too. So we decided to just do the one peak today and call it a day. Arapahoe Peaks (North and South) and to the left the hump you see is Old Baldy. On the descent, I landed one of my steps on some talus in a bad way and tweaked my right ankle again. Ever since my ankle injury in Feb 2013, I've lost some dorsiflexion in my right ankle. When I step in a way that requires max (usually 20 degrees) dorsiflexion, it causes strain on other things in my ankle (ligaments, muscles, etc.). This is almost a regular occurrence now and I just accept it as part of who I am now. This step did cause my ankle to hurt a lot and some ligament was very unhappy with me for nearly 2 miles or so. I was moving incredibly slow trying not to hurt it more. Mark and Greg were incredibly patient even though I encouraged both of them to go on ahead many times. Finally after reaching flatter trail by the lake I was able to move at a more normal pace again. We stopped only once that I can remember on the way out at a spot where clearly tourists have been feeding marmots since the marmots here were more aggressive than I had ever seen. Hi Marmot, the only thing I'll feed you is a piece of my boot. We finished our hike about 2pm, almost ten hours after our start time of 4:15am. We agreed to meet up with Greg next time he's out from NH and then Greg took off for Estes Park. Mark and I had some great conversation on our ride back to Boulder but skipped lunch since it was already so late in the day. Oh, and for the record, I did not fall into the creek on the way back to the trail head. However, I am fairly certain someone (~ahem~... Mark...) might of casually stepped into a pile of mud that nearly swallowed his boot.